Good morning! 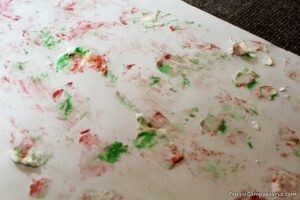 I can’t believe I have done so many ‘family fun’ Finish it Fridays! 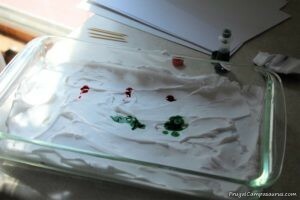 I have really enjoyed the projects with our youngest. I probably should do a few practical Finish it Fridays. I have more mending to do, spindles to paint and even some rhubarb I’d like to can. Maybe soon, I will get to those. I had so much fun with the tie dye projects, that I’d also like to try some bleach projects. To be frugal, I’m going to wait and find garage sale shirts instead of buying new shirts, so the bleach will need to wait. Sooo many projects to finish! This week, I decided to work on a Christmas project, since I had all the supplies and it sounded more fun than practical projects. I love Christmas! I wish I could decorate our house like Clark Griswold’s in the Christmas Vacation movie! Not a frugal idea though, since I can’t even imagine what the electric bill would be like. I don’t put up Christmas lights or decorate the house until after Thanksgiving, but I need to learn to craft and make Christmas gifts before November. I would have more time and be more relaxed in December if I could just work on snowmen or red/green projects in the heat of the summer. It is just sooo hard to do when it is 90 degrees out. 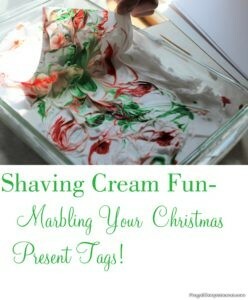 I am trying though, so this Finish it Friday is marbled Christmas tags and wrapping paper. We actually did this once, years ago and it was so fun- I wanted to marble everything! Now, I’m out of the Christmas present tags. I reuse them, but eventually they get worn looking, so I can finally marble again and make new ones! 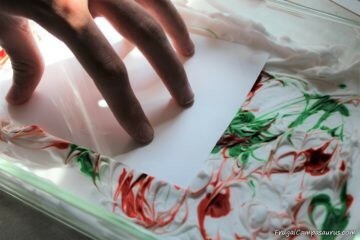 Marbling is easy. 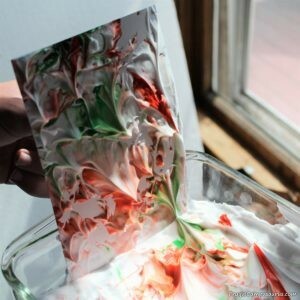 You need : shaving cream, food coloring, toothpicks, old rags that will get thrown away (or paper towels) a shallow pan or tray, old newspapers and items to marble. I have only used paper items, like envelopes, card stock, bookmarks, glossy picture paper and typing paper. This time I also used some large paper from an end roll that I got at the local newspaper printer for only $2. 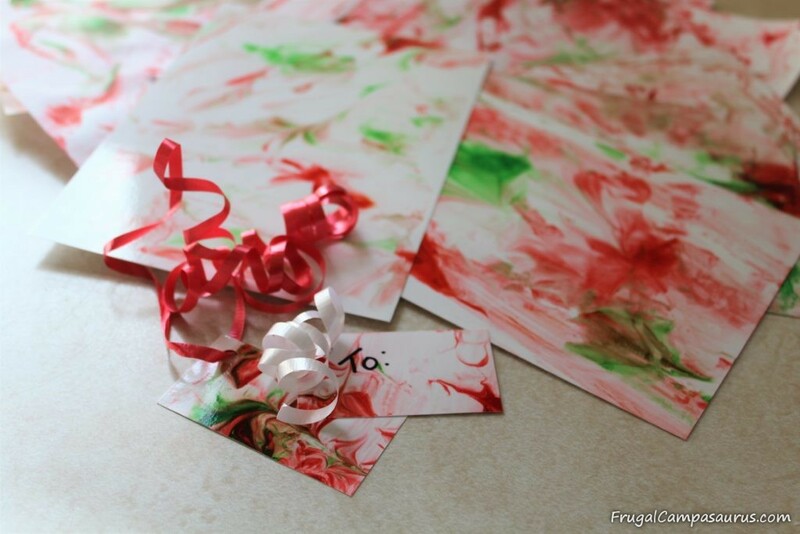 It is easier to cut the card stock and picture paper into gift tags after marbling and letting it dry. 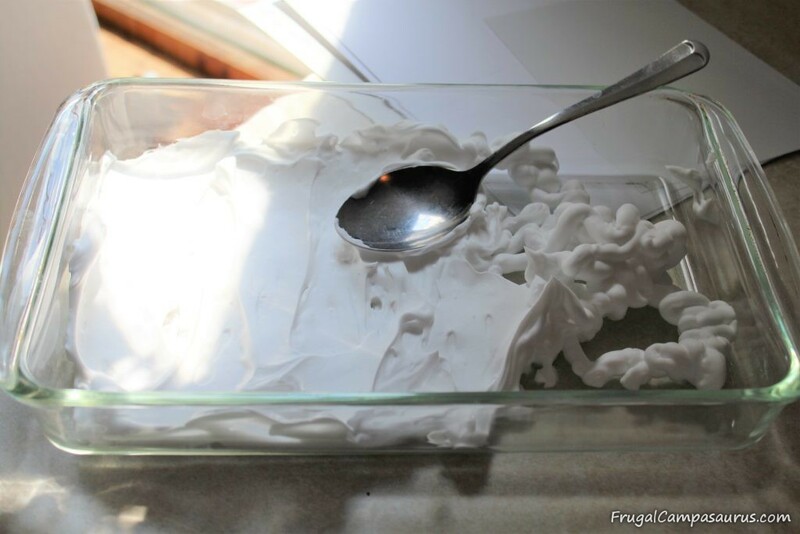 First, spray some shaving cream into the shallow tray. 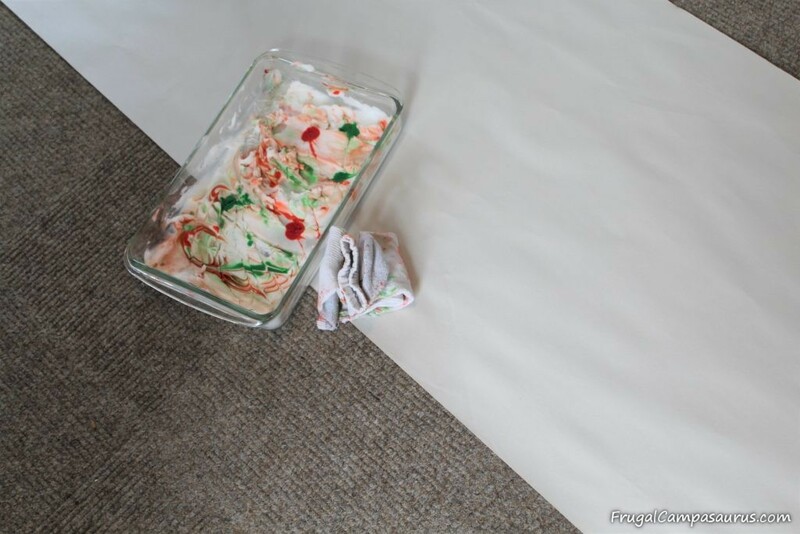 I used a 9×13 cake pan, but a cookie sheet or plate also works well. 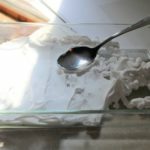 Smooth out the shaving cream with a spoon, it doesn’t need to be thick, an inch is good, because just the surface will be used. Put some drops of food coloring on the shaving cream, I did 4-5 of each color. Then swirl the colors with the toothpick. Don’t swirl too much or the colors become murky and blend together. You could try more blending with colors that make another color, like yellow and blue – then there would also be some green. My red and green just made brown, not a good Christmas color. 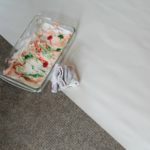 Later, after the colors get mixed from doing a few papers, I just scooped off some of the murkier parts and added more shaving cream and food coloring, so I could keep marbling. Press the item to be marbled on top off the shaving cream. Push it in so there is good contact and coverage on the paper front. Lift it out and set it on some spread out old newspapers. This is the fun, messy part. 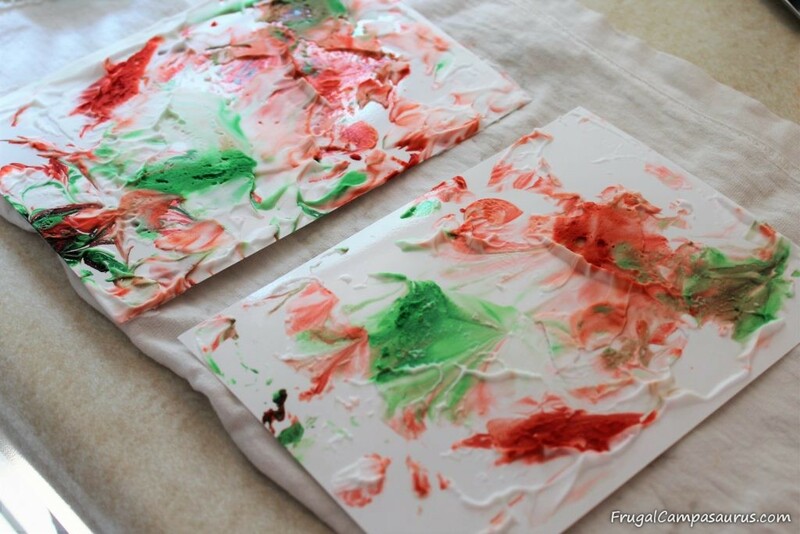 Before it is wiped off, you could press another paper on top of the first one, to get a second project and extra use from the shaving cream. 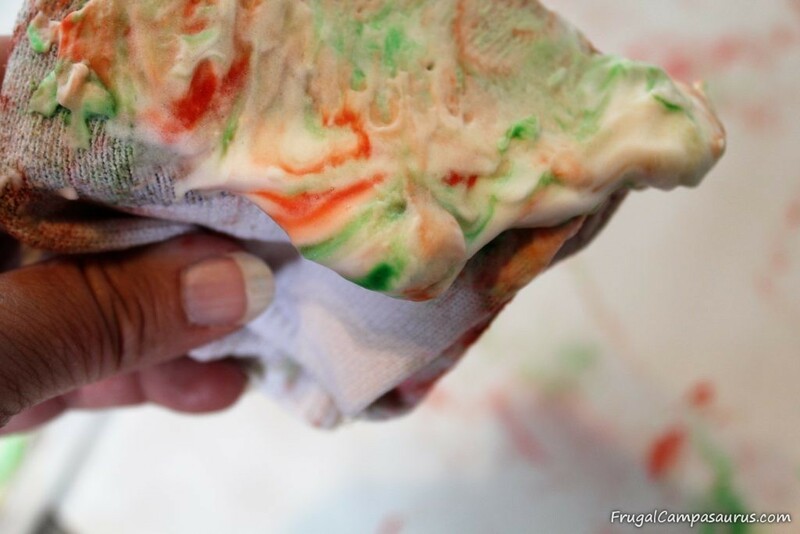 Then, take an old rag and in one stroke, wipe off the shaving cream. 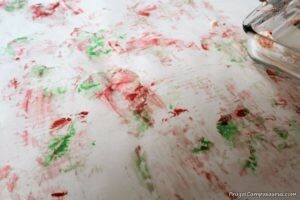 Do not rub in circles, and do use a new, clean part of the rag every time you wipe off a section off the shaving cream. Otherwise, the colors smear and don’t look marbled. Then, wait a few minutes and Ta-Dah! It is done. It is really quick, easy and fun! 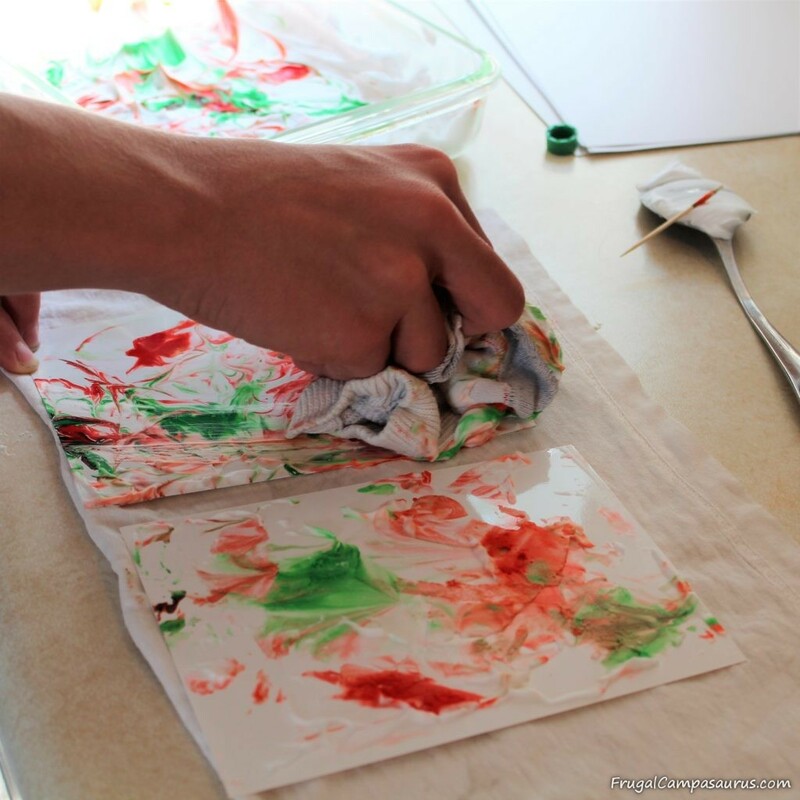 My kids enjoyed helping, especially when they were younger, but remember- shaving cream is like soap and will sting the eyes and food coloring is permanent, so I always wear old clothes and spread out newspapers. 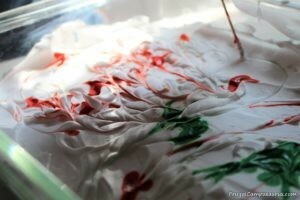 Actually, I wear old clothes for most projects: I am very messy, probably worse than the kids. This time, I tried making wrapping paper with the end roll newsprint paper. 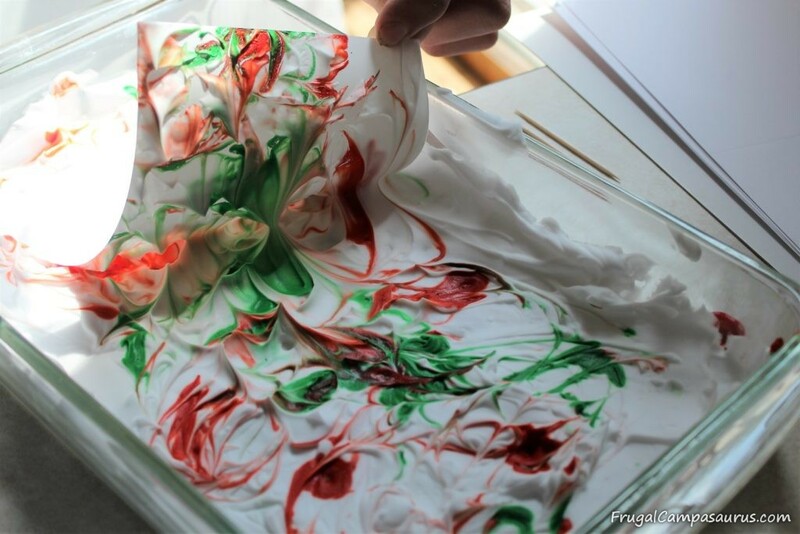 Since it didn’t fit in the cake pan, I used an old rag and dabbed on the shaving cream/food coloring swirls and then wiped it with a different clean rag. It worked ok, though it might be better as a fun, messy, outside project. lifted outWhat pretty Christmas colors! christmas tagLove the Christmas tags! 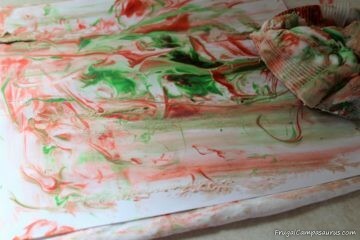 I hope you enjoyed our Christmas marbling projects. 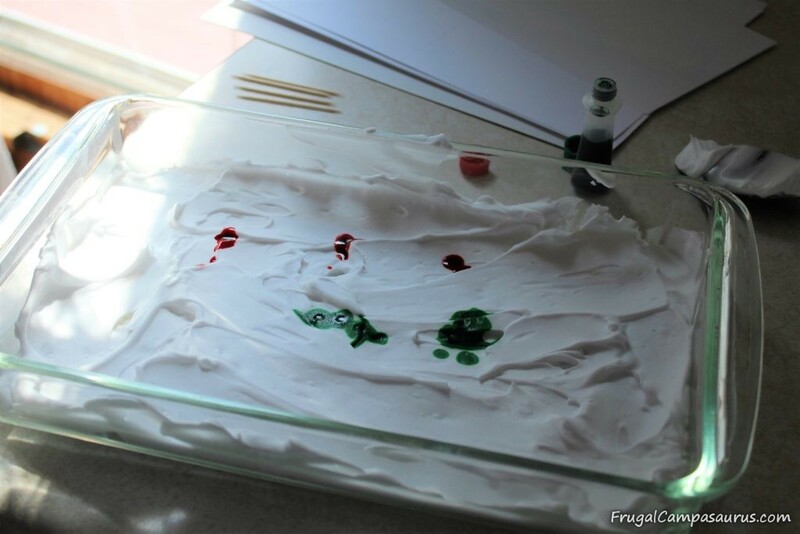 It was fun sharing the projects with you and our youngest! Maybe it will motivate me to work on more Christmas crafts and gifts, even though it is in the 80’s now. 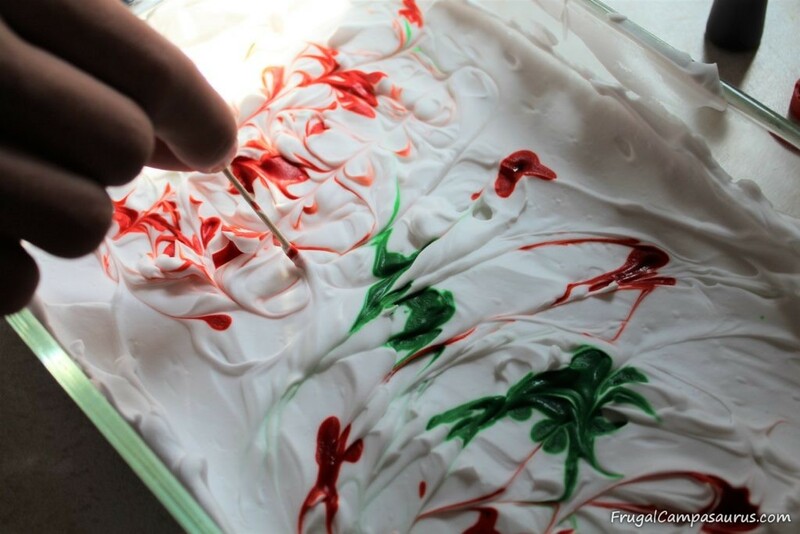 Happy Camping (or marbling everything)! Previous Post:Meatball Make-Over: Not just the Oven, the Dutch Oven works too!